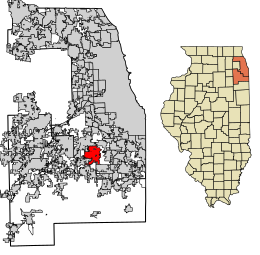 Location of Tinley Park in Cook County, Illinois. With the railroad came industry and commerce. 1905 saw the Diamond Spiral Washing Machine Company found its first factory in Tinley Park. Local businessmen established an electric utility in 1909. A bottling facility for soda was operated in Tinley Park until the 1950s. Inventor John Rauhoff developed and manufactured a waterproofing additive for cement called Ironite, later used in the construction of Hoover Dam. In the latter part of the 20th century, Tinley Park was, and remains to be, an area of rapid suburban expansion to the west and south of the original site, with over 11,000 housing units constructed between 1970 and 1994. The Hollywood Casino Amphitheatre (formerly named "The World Music Theater", "Tweeter Center Chicago", and until 2015, "First Midwest Bank Amphitheatre"), an outdoor venue which seats 28,000, is located in Tinley Park. Tinley Park is located at 41°34′26″N 87°48′14″W﻿ / ﻿41.57389°N 87.80389°W﻿ / 41.57389; -87.80389 (41.573800, −87.803891). According to the 2010 census, Tinley Park has a total area of 16.039 square miles (41.54 km2), of which 16.02 square miles (41.49 km2) (or 99.88%) is land and 0.019 square miles (0.05 km2) (or 0.12%) is water. The village lies on the Tinley Moraine and/or the Valparaiso Moraine. In the village, the population was spread out with 26.6% under the age of 18, 8.1% from 18 to 24, 31.0% from 25 to 44, 23.5% from 45 to 64, and 10.7% who were 65 years of age or older. The median age was 36 years. For every 100 females, there were 93.8 males. For every 100 females age 18 and over, there were 90.5 males. The median income for a household in the village was $61,648, and the median income for a family was $71,858 (these figures had risen to $70,480 and $84,072 respectively as of a 2017 estimate). Males had a median income of $50,595 versus $34,401 for females. The per capita income for the village was $25,207. About 1.1% of families and 2.5% of the population were below the poverty line, including 2.5% of those under age 18 and 3.6% of those age 65 or over. Tinley Park is divided between two congressional districts. Most of the village, including all the area in Bremen Township and Rich Township, as well as the area in Will County, is in Illinois's 1st congressional district; the area in Orland Township south of 167th Street, as well as most of the area southwest of 163rd Street and Ozark Avenue, is in the 3rd district. Tinley Park includes four public elementary school districts - Kirby School District 140, Community Consolidated School District 146, Summit Hill Elementary School District 161, and Elementary School District 159. The town also includes three parochial Pre-K through 8 elementary schools: St. George, which is Catholic; Trinity Lutheran, affiliated with the LCMS; and Southwest Chicago Christian School of Tinley Park. Victor J. Andrew High School (Consolidated High School District 230) and Tinley Park High School (Bremen Community High School District 228) are both secondary schools located in Tinley Park. A small portion of Tinley Park students go to Lincoln-Way East High School. Most residents of Tinley Park are located within the residency boundaries for Moraine Valley Community College; the rest reside in the community college district for South Suburban College. A very small portion of Tinley Park goes to Joliet Junior College. ^ "Tinley Park, IL - Official Website - Mayor". Tinleypark.org. Retrieved 22 August 2017. ^ a b "Population and Housing Unit Estimates". United States Census Bureau. Retrieved June 9, 2017. ^ a b "Profile of General Population and Housing Characteristics: 2010 Demographic Profile Data (DP-1): Tinley Park village, Illinois". United States Census Bureau. Retrieved March 20, 2013. ^ "America's Best Place to Raise Your Kids". BusinessWeek. November 17, 2009. Retrieved 2009-11-18. 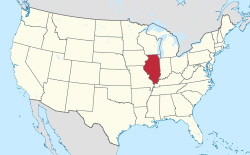 ^ "Tinley Park Among Safest US Cities: Report". Patch.com. 4 August 2017. Retrieved 22 August 2017. ^ Bureau, U.S. Census. "American FactFinder - Results". Factfinder.census.gov. Retrieved 22 August 2017. ^ "Tinley Park music theater gets new name, again". Chicago Tribune. Retrieved January 25, 2015. ^ "First Midwest Bank Amphitheatre". In Concert With You. First Midwest Bank. Retrieved May 17, 2013. ^ Profile of Selected Social Characteristics, Tinley Park, Illinois. U.S. Census Bureau. Accessed 2007-07-11. ^ Bureau, U.S. Census. "American FactFinder - Community Facts". factfinder.census.gov. Retrieved 22 August 2017. ^ "Summit Hill School District 161 - Frankfort, Illinois". www.summithill.org. ^ "About Our District Archived 2017-01-09 at Archive.today." Elementary School District 159. Retrieved on January 9, 2017. ^ "Tinley Park Campus". Swchristian.org. Retrieved 17 May 2016.